A gripping adventure, a seaborne romance, and a twist on the tale of Scheherazade—with the best food ever served aboard a pirate’s ship. The year is 1819, and the renowned chef Owen Wedgwood has been kidnapped by the ruthless pirate Mad Hannah Mabbot. He will be spared, she tells him, as long as he puts exquisite food in front of her every Sunday without fail. It’s rare to encounter a novel that is a product born of craftsmanship and love these days. 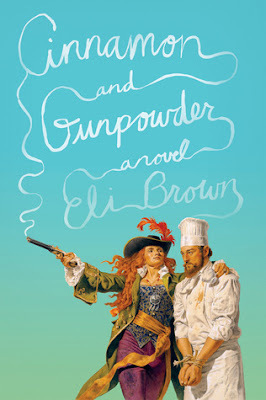 Gunpowder & Cinnamon is a true work of beauty; a story written so tenderly, with such care that one can’t help but be completely enraptured by the world presented. This is story telling at it’s best and there is so much more to it that meets the eye! Food, pirates, the Opium trade (and Britain’s involvement in it), the ocean and a love for most of those things are the subjects of Brown’s caring ministrations in this profession of amour. Truly, the historical and food detail packed into this can be considered nothing short of obsessive on the author's part. And said obsession gives the reader a full-bodied reading experience that won't soon be forgotten. I could not get enough of the saffron-sauced dishes, the swashbuckling sass or the haunting, lore-filled world of pirates, privateers and one shanghaied chef! I'm definitely putting this on my to-read list. My stomach has started rumbling! This is one of those books that the name is so catching, and then the premise so intriguing, that I HAVE to read it. I think the last time a book grabbed me so fast by just the name it was The Guernsey Literary and Potato Peel Pie Society. Thanks for the recommendation! This looks very different from other stories - and no, I couldn't cook a gourmet meal every Sunday on a pirate ship, not even sure I'd want to at home! Actually you wouldn't get me on any ship - I get seasick.